In this Agatha Christie-like mystery, two more suspects have appeared. Tobias Labadee, a Sailormouse from the Caribbean has travelled the world and just arrived in York after sailing up the Ouse on a boat from Hull. He was witnessed skulking outside of Fairfax House on the day of the robbery. Did the lure of the riches within, tempt him to break in to Fairfax House and steal the jewels? 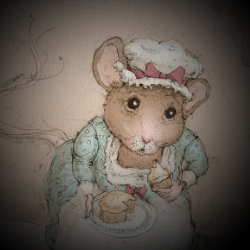 Molly Pickering, is Housemaid in the Townhouse Mice household. Molly was at the scene of the crime and had ample opportunity. She was bidden to put the jewels away on the evening of the theft – but forgot to lock the drawer! With a sick sister, whose expensive medicines she is saving money for, is Molly’s story that she ‘forgot’ to lock the drawer nothing more than tall tale?